Bright sunshine, olive groves, citrus trees, rolling hills and beautiful beaches are just a few things that I remember about my travels to Sicily. Small cars and scooters buzzing around the tight, lava stone roads of my parents home town and cramming the curbs in piazza made even the smallest town seem as alive as New York. Countless bars and trattorias lined the piazza and patios filled with people night after night enjoying things like a wood fired pizza, cannoli and coffee, incredible Sicilian gelato or a cold drink. The lifestyle seemed to good to be true. I soon figured out that the Sicilian way of living was a quite different from my life here in Canada. After a hard day's work, enjoying life was a priority. This is not to say that Sicilians over indulge but merely take the time to sit down, relax and hangout with friends or family and enjoy this precious time. Food was definitely at the forefront of this time. Sicily was blessed with hot sun, rich volcanic soil and of course the bountiless sea that surrounds it. This being said, incredibley amazing ingredients are not hard to find. Fresh seafood, citrus and produce like I have never seen before made for some of the best food I had in my lifetime. 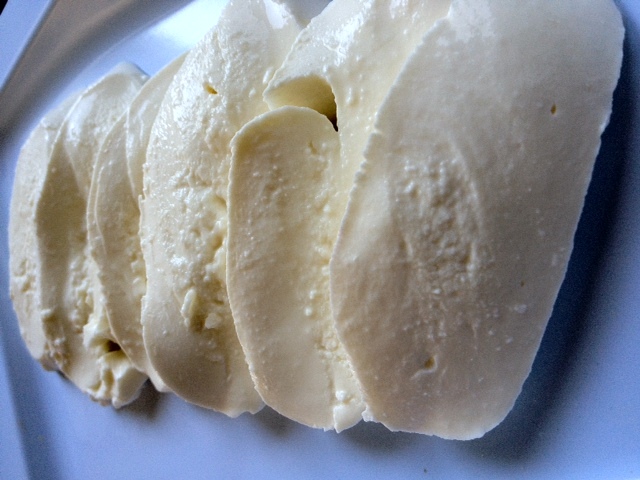 My inspiration for this recipe comes from these travels and my favorite Sicilian cook, my mother. Growing up, my mother always prepared orange salad as a side dish for many great summer meals. Refreshing and tangy with the right amount of bite from onion and the way the juices and olive combined to make a heavenly dressing, it is truly one of my favorite things to eat. Of course being a chef, I love to experiment in the kitchen. I dont stray too far from traditional ingredients but a slight manipulation is all I need to make it my own. Fennel is no stranger to salads in Sicily but in my preparation I decided to grill it and pair it with fresh oranges, red onion, fresh basil and mint and of course a good quality Sicilian extra virgin oil all sitting on a bed of fresh buffalo milk mozzarella. The result is and incredible combination of flavors, textues and colors. 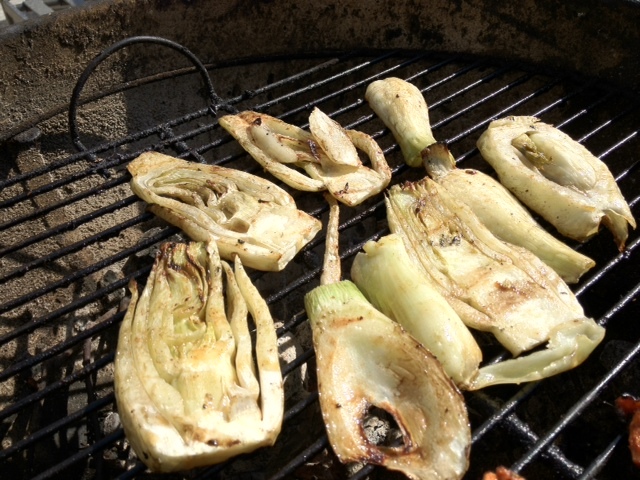 The caramelized grilled fennel is intense but not overpowering. The oranges and sharp red onions give sweetness and a good bite to the dish. Basil and mint give freshness and the creamy, buttery rich mozzarella bring it all together for a flavor and mouth feel that is out of this world. Of course, this salad can be made with raw fennel as well but I feel that grilling it is what brings this salad over the top. One bite and you will find it difficult to stop eating this refreshing and delicious salad. 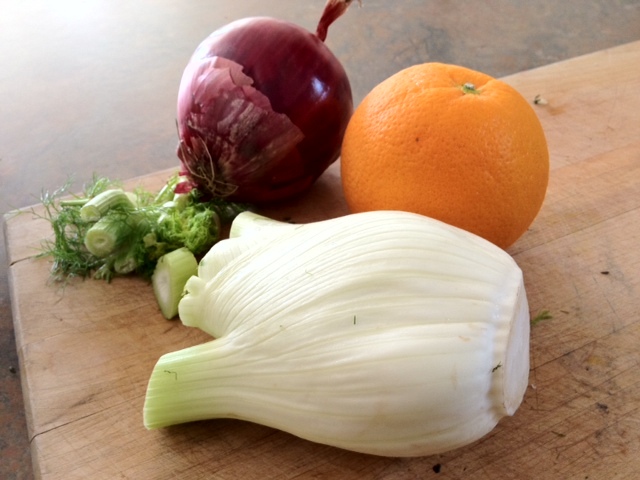 Cut fennel length wise 1/4 inch thick. Drizzle with olive oil and grill until slightly charred on the edges and nicely caramelized. Set aside and allow to cool. 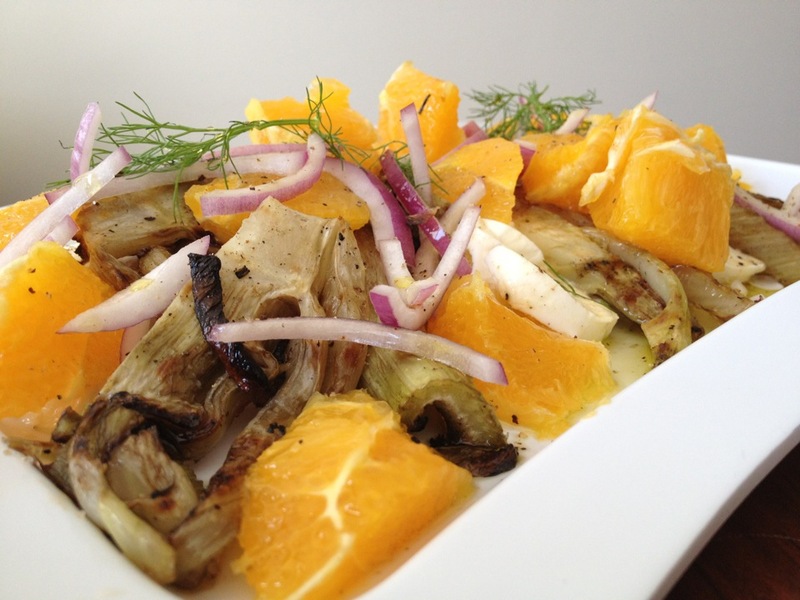 Layer the grilled fennel with oranges and sliced red onion on top of the mozzarella and sprinkle with salt and pepper. Tear the mint and basil leaves by hand and place over salad. Drizzle salad with extra virgin olive oil and remaing juice from cut orange.